Thomas Dutton appears, according to the poster of rectors in the church, to have been the incumbent for an infeasibly long time. There’s confusion, because there were actually four Dutton rectors in a row. CCED definitely shows that John and Thomas were two separate people; this doesn’t seem to be a case of confusion between old style and new style dates. The Duttons were in office during the civil war and the Commonwealth that followed, when religious matters were in great confusion. Many priests in England – somewhat more than half of the total – were thrown out of their churches in this period, losing their living, their property and often their liberty. Their families suffered great distress. Eversholt was in an area of the country which notionally supported the Rounhead side and so perhaps would be treated more leniently than otherwise, but quite what happened to the rector is unclear. A good general description can be found in The parish registers and records in the diocese of Rochester : a summary of information collected by the Ecclesiatical Records Committee of the Rochester Diocesan Conference, W E Buckland, Kent Archaeological Society, 1912, available for free at https://archive.org/details/parishregistersr00chur on page 9. Normal service was resumed on the restoration of Charles II in 1660. Thomas Dutton, Rector, was buried 25 june 1650. Theodore Dutton, Rector, was buried 21 Oct 1680. James Dutton, Rector, was buried 1 Mar 1698. Elizabeth Dutton, daughter of Thomas Dutton junior and his wife Elizabeth, was baptised 28 dec 1627. This must be Thomas-the-rector’s son, not recorded as baptised. (He must be the 4th one in the Oxford list below). Thomas Dutton, son of Thomas Dutton, junior, and his wife Elizabeth, was baptised 15 Aug 1630. Thomas Dutton Junior married Elizabeth Whitmore on 27 Oct 1627 after banns. Judging from their daughter’s baptism date above, Elizabeth must have had quite a bump. Thomas Dutton died and was succeeded as rector by his son, Theodore Dutton. 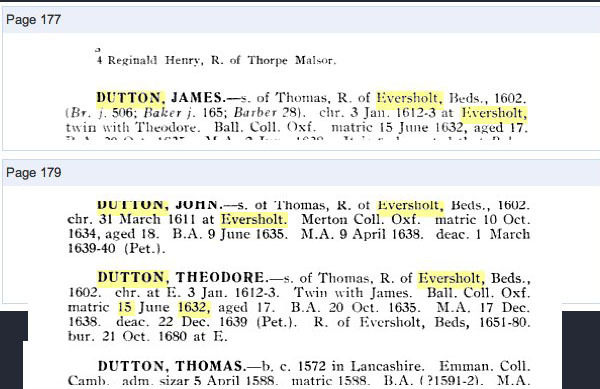 Dutton, James s. Thomas, of Eversholt, Beds, pleb. Balliol Coll., matric. 15 June, 1632, aged 17; B.A. 20 Oct., 1635, M.A. 2 June, 1638, perhaps vicar of Eversholt, Beds, 1681-99, baptized there 3 Jan., 1612, brother of John 1634, and Theodore. See Foster’s Index Ecclesiasticus. Dutton, Theodore s. Thomas, of Eversholt, Beds, pleb. Balliol Coll., matric. 15 June, 1632, aged 17; B.A. 20 Oct., 1635, M.A. 17 Dec., 1638, rector Eversholt 1651-80, baptized there 3 Jan., 1612, and buried 21 Oct., 1680, brother of James 1632, of John 1634, and Thomas 1626. See Foster’s Index Ecclesiasticus. Dutton, John s. Thomas, of Eversholt, Beds, sacerd. Merton Coll., matric. 10 Oct., 1634, aged 18; B.A. 9 June, 1635, M.A. 9 April, 1638, baptized at Eversholt 31 March, 1611, perhaps vicar of Dartford, Kent, 1652, brother of James 1632, and of Theodore. See Foster’s Index Ecclesiasticus. Dutton, Thomas s. Thomas, of Eversholt, Beds, sacerd. Merton Coll., matric. 20 Jan., 1625-6, aged 18; B.A. 3 Dec., 1628, M.A. 5 July, 1632, his father compounded for the first fruits of the rectory of Eversholt 28 Jan., 1602-3. See Foster’s Index Ecclesiasticus. I can’t find these people in index ecclesisasticus. So this Thomas Dutton only graduated in 1628. “Compounded for the first fruits” means “became rector”. His father became the rector of Eversholt in 1602. CCED says that there was a visitation to Thomas Dutton in March 1604 and he got into a bit of trouble. There wasn’t a surplice available for him to wear. 1604-10-14, he and the curchwardens certified that one had been provided, and that he usually wore it. What does that have to do with this Liber Cleri entry for 1603? that says he was appointed rector at Eversholt on 26 Jan 1642. There was a libc, a bishop’s visitation, in 1662. He died on 2 Feb 1681, which must have been quite inconvenient, having been buried in the previous October. The other remarkable event was his subscription to the Act of Uniformity of 1662. That was meant to flush out all the nonconformists. The fact that Theodore subscribed meant that he was a straight-down-the-middle Church of England type. James Dutton was appointed rector of Eversholt on 2 Feb 1681, and died on 1 April 1699, something over a year after he was buried. Clearly, the CCED database takes appointment of the next rector as the date of death of the previous one. James left a will but I can’t find it in the usual places online. There was a Matthew Dutton who was a nonconformist priest around 1700. Was he a relative?